Apartment on the second (and last) floor recently renovated (no elevator) with 1 double bedroom and a bunk bed for children, there is also a key safe, kitchen (equipped) with coffee maker, kettle, coffee machine for espresso with 10 hot for week included, living room with double sofa bed + 1 armchair (which becomes a single bed): Total 5/6 beds. Air conditioning in the bedroom and living room, 1 bathroom with shower with hot water, toilet and bidet, 1 sink with hot water, 2 terraces, free Wifi / Internet, satellite TV with international channels in your language, washing machine, iron, high chair for baby, sheets and towels included. in Tenerife there is a good temperature all year round. 24-hour car check-in, door openings with code. Central to services (restaurants, bars, taxis, buses, Supermarket), 200 meters beach. Please only smoke on the terrace, Thanks. Bathroom with large shower, toilet, bidet, storage cabinet, hairdryer, towels included in the service. You are in the center of Playa de Las Americas, if you want you have everything without using the car. You can comfortably lie down in the quiet pool, walk by the ocean or go for locals: the choice is yours! Apartment well equipped, great location, owner responds very quickly to any questions asked, only fault was that the sofas were a bit uncomfortable for sitting on. We have had a fabulous time, the apartment is exactly as shown on the home and away website, very clean and everything you need for self catering. The location was perfect for our type of holiday as we love Tenerife and have stayed in different hotels over the years. 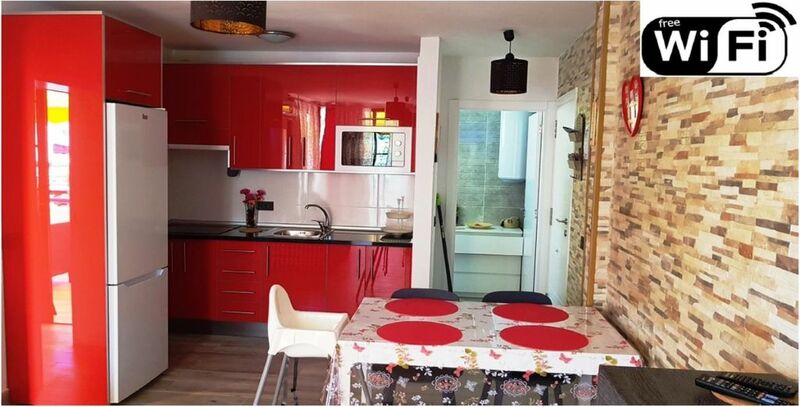 We would definitely recommend this apartment and look forward to staying again in the future. Lovely apartment, very modern and clean, owner acted very promptly and was very obliging to any request we made. Powerful walk in shower, we’ll equpped kitchen. Large bed which was very comfortable, however if staying longer than a couple of weeks required a more comfortable sofa. Central location to all amenities. In june i'll go in Tenerife and i will test the sofa. I'll bought it because it become a bed sofa. Vey clean complex with a gorgeous swimming pool with bar area and brand new sun loungers . Well secured which is a must ,key to pool ,key into complex no body can just walk in . Minutes away from beach and the livelly nightstrip but far away not to hear any noise. Plenty places to eat and all at a reasonable prices . also worth a trip to Siam Water park 10/10,free bus to and from and just over the road from the apartment . Apartment in the center of Playa de Las Americas; also excellent for those who do not want to use the car. Very close to shops and restaurants, supermarkets, taxis. Next to the beach. PIscina in the complex. Playa de Las Américas is a lively resort on the south coast of Tenerife and is renowned for being the liveliest resort on the island. Night-time lovers flock to this buzzing city to enjoy the vibrant nightlife and fun celebrations. In addition to the atmosphere of revelry, this famous tourist destination boasts numerous strips of long golden beaches that attract hordes of visitors looking for a day of sun and relaxation. The main beach boasts calm waters and is a haven for vacationers all year round. Children play, couples walk hand in hand and groups of friends gather together. The facilities are excellent and kiosks selling refreshing drinks and ice-creams line the sand and you can even find volleyball nets to keep you in training. There is also a wide variety of water sports and numerous shops to rent equipment such as surfboards, diving suits and snorkelling equipment. Also available are boat trips ranging from a day on a pirate ship to a cruise along the coast aboard a catamaran. Maybe you can not wait for a day to watch dolphins and whales? Or would you like to discover the underwater world during a submarine safari?